Here at Million Mile Secrets, we’re big fans of Hyatt hotels. They’ve got a reasonable award chart, gorgeous locations in incredible destinations, and top-notch amenities and service. Plus, Hyatt points go further than many other hotel programs. If you’re looking for a tropical getaway, Hyatt has 20+ hotels in the Caribbean and Mexico where you can redeem points for a free stay. Some are even all-inclusive resorts! And it’s easy to earn Hyatt points by transferring Chase Ultimate Rewards points at a 1:1 ratio from cards like the Chase Sapphire Preferred, which comes with a 50,000 Chase Ultimate Rewards point sign-up bonus after completing the minimum spending requirements. Or earn Hyatt points directly from The Hyatt Credit Card, which offers 40,000 Hyatt points after meeting minimum spending. Either way, you could use the bonus from these cards for award nights in the Caribbean or Mexico worth ~$2,000 (or more)! I’ll show you 5 top hotels to experience with your Hyatt points in the Caribbean and Mexico! Hyatt hotels include Andaz, Grand Hyatt, Hyatt, Hyatt Centric, Hyatt Place, Hyatt Regency, Hyatt Resorts, Hyatt House, Park Hyatt, Hyatt Ziva, Hyatt Zilara, the Unbound Collection, and Miraval brand hotels. We suggest using Hotel Hustle to find hotels, because it shows you how many points you’ll need for your specific travel dates, and if award nights are available! Or use AwardMapper. We haven’t personally stayed at all these hotels, but they have great reviews! Let us know if you’ve had an experience with any of them. Note: Hyatt all-inclusive hotels are based on single or double occupancy. You’ll pay more in cash or points for additional people, and there’s a maximum of 4 people per room. Infants and toddlers aged 2 and under stay free at Hyatt Ziva family resorts. Hyatt Zilara hotels are adults only. And you won’t pay resort fees when you redeem points for award nights at Hyatt hotels! You can use your Hyatt points for award nights at the family-friendly all-inclusive Hyatt Ziva Rose Hall in Jamaica. Folks on TripAdvisor have great things to say about the staff, service, and location of this hotel. Save ~$1,760 on 2 Nights at the Hyatt Ziva Rose Hall in Jamaica With Hyatt Points! Standard nights here start at ~$880 or 25,000 Hyatt points per night based on double occupancy. Because this is an all-inclusive hotel, all your meals, snacks, drinks, and entertainment are included in the price – no elite status required. That’s a huge savings! You’ll pay more in cash based on the number of people in a room, or 12,500 additional Hyatt points per person per night if you have more than 2 people. Either way, there’s a maximum of 4 per room. Ask for a late checkout if you want to stay longer. And it never hurts to ask if the front desk can store your luggage if you have a late flight. That way you get more time at the beach. And more food & drinks! If you need extra points to take the kids, remember, with the Chase Sapphire Preferred, you’ll earn bonus points when some of your minimum spending is in the 2X categories of travel and dining. And 5,000 more Chase Ultimate Rewards points when you add your first authorized user and make a purchase in the first 3 months of account opening. If you’re heading to Aruba, consider the Hyatt Regency Aruba Resort Spa and Casino. TripAdvisor reviewers love this hotel for the beautiful grounds and friendly staff. There’s plenty to do here for the whole family, including a golf course and multi-level swimming pool with fun waterslides. And if you want to try your luck, there’s a casino on the premises too! Nights here cost $700+ after taxes and fees during peak season, or 25,000 Hyatt points per night. And if you want to stay longer, mix-and-match paid and award nights with Airbnb. We found lots of places available at every price range! Here are our tips on how to find a safe and comfortable Airbnb. Nights at the Hyatt Ziva Puerto Vallarta cost ~$647 or 20,000 Hyatt points per night based on double occupancy. And can exceed $1,000 during peak season! So the sign-up bonus from the Chase Sapphire Preferred or Chase Hyatt card could be worth at least ~$1,300 (or over $2,000 during peak season) if you redeemed points here for 2 nights! You can explore the town of Puerto Vallarta, or book a tour for whale watching or scuba diving. There’s also a kids club with supervised activities. When you meet the minimum spending requirement on the Chase Sapphire Preferred card, you’ll have at least 54,000 Chase Ultimate Rewards points. And, you can earn 5,000 more points when you add an authorized user and make a purchase in the first 3 months, for a total of 59,000 Chase Ultimate Rewards points. That’s nearly enough for 3 nights for 2 people at the Hyatt Ziva Puerto Vallarta. In peak season, you could save over $3,000 if you use your points. Now that’s a great deal! If you like the ease of cruises, you might like an all-inclusive hotel like this. Because drinks, meals, and activities are all rolled into the room price. Folks on TripAdvisor say this hotel is great for families and couples! The Grand Hyatt Playa del Carmen Resort has its own private strip of beach. It also has rooms with swim-up pools, and in-house restaurants and bars. It’s located on Playa del Carmen’s La Quinta Avenida, so you’ll be walking distance to shopping, dining, and lots of things to do. Or take a day trip to see the Mayan ruins and archaeological sites! Playa del Carmen is also 1 of the top spots in the world to go diving or snorkeling thanks to the underwater caverns and abundant sea life. Nights here can cost over $400 after taxes and fees, or 20,000 Hyatt points per night. This hotel is perfect for a romantic getaway. If you and a partner went for 2 nights, you’d save over $800 on a vacation in Mexico! Nights at the Hyatt Zilara Cancun can cost over ~$1,000 or 25,000 Hyatt points per night for 2 people. So the 50,000 Chase Ultimate Rewards points you’ll earn from the Chase Sapphire Preferred are worth $2,000+ for 2 nights. That’s an incredible deal! This is Hyatt’s most popular all-inclusive resort, and it has excellent reviews on TripAdvisor. Because it’s a Zilara resort, it’s adults only. You can enjoy dinner near the beach with wine or cocktails included. Perfect for a romantic weekend trip! Take a short ferry ride to Isla Mujeres for gorgeous scenery, snorkeling or scuba diving, and shopping. Don’t miss the cozy restaurants or gelato places! Because you’ll be in the Hotel Zone, you’ll have easy access to the beach. And if you like to dance, it’s easy walking distance to lots of well-known night clubs. 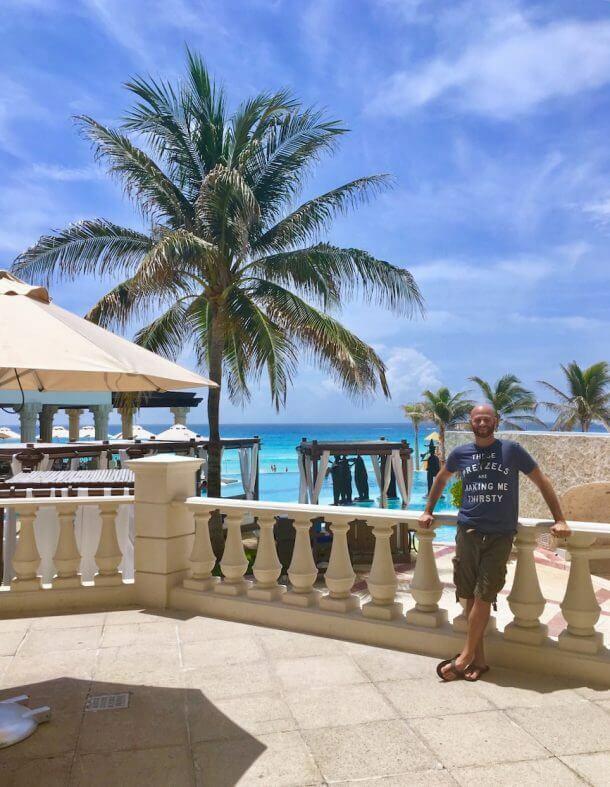 So it’s possible to relax, explore, and party in Cancun! If you want to use your points here, plan ahead because award nights can sell out quickly! 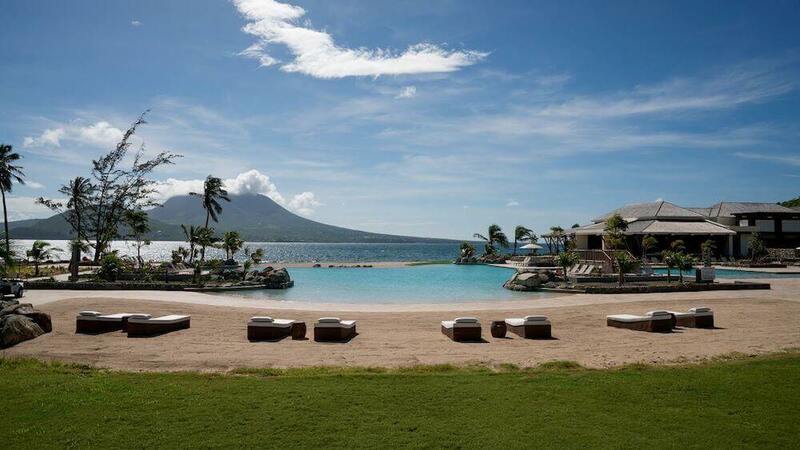 The Park Hyatt St. Kitts opened in November 2017 and already, folks on TripAdvisor rave about this luxurious and beautiful resort. It’s a top-tier category 7 Hyatt hotel, and costs 30,000 Hyatt points per night. With the sign-up bonus, authorized user bonus, and points from meeting minimum spending on the Chase Sapphire Preferred card, you’d earn a total of 59,000 Chase Ultimate Rewards points. That’s just 1,000 points shy of a 2-night stay here! Peak season standard rooms here can cost $800+ including taxes and fees. So for 2 nights, you’d save over $1,600. Hyatt points are easy to earn because they’re a Chase Ultimate Rewards transfer partner. And if you’re just starting out in this hobby, the Chase Sapphire Preferred is the #1 card we recommend for beginners. The Chase Sapphire Preferred comes with a sign-up bonus of 50,000 Chase Ultimate Rewards points when you spend $4,000 on purchases within the first 3 months of opening your account. Plus an additional 5,000 Chase Ultimate Rewards points when you add your first authorized user and make a purchase in the same timeframe. This is a terrific card because you’ll earn 2X Chase Ultimate Rewards points per $1 on travel and dining. And you’ll have the flexibility to redeem your points for paid travel at a rate of 1.25 cents per point through the Chase Ultimate Rewards travel portal. Or transfer points to partners like Hyatt, United Airlines, Singapore Airlines, and more to get potentially much more value. Note: If you’ve opened 5+ cards from any bank (NOT counting Chase business cards and these other business cards) in the past 24 months, it’s unlikely you’ll be approved for the Chase Sapphire Preferred. With the Chase Hyatt card, you’ll earn 40,000 Hyatt points after spending $2,000 on purchases within the first 3 months of account opening. And another 5,000 bonus Hyatt points when you add your first authorized user and make a purchase within the same timeframe. Many of us on the Million Mile Secrets team keep the Chase Hyatt card in our wallets year after year. Even with the $75 annual fee, it’s worth hanging on to, because every account anniversary, you get a free night at a category 1 to 4 Hyatt hotel anywhere in the world! Don’t forget to check out our list of the best hotel credit cards for stays at Hyatt and other hotel chains. Whether you’re looking for a romantic getaway or a fun beachfront family vacation, there are lots of outstanding Hyatt hotels in the Caribbean and Mexico where you can get free stays with the right credit cards! Want to stay free, too? You can earn Hyatt points by transferring Chase Ultimate Rewards points from cards like the Chase Sapphire Preferred, which comes with a 50,000 Chase Ultimate Rewards point sign-up bonus after completing the minimum spending requirements. And an additional 5,000 Chase Ultimate Rewards points when you add your first authorized user and make a purchase in the same timeframe. It’s our favorite card for anyone new to the miles and points hobby. Or consider The Hyatt Credit Card, which offers 40,000 Hyatt points after meeting minimum spending. Plus 5,000 bonus Hyatt points when you add your first authorized user and make a purchase within the same timeframe. This card is a good choice if you’ve already opened lots of cards, because it’s not impacted by the Chase “5/24” rule. If you prefer other hotel chains, there are plenty of cards for you, too! Check out our list of the best hotel credit cards. Have you stayed at any of these hotels? We’d love to hear your experiences in the comments!